Our typical tea time tray includes sweet treats. But we decided to try something savory and substantial, such as bacon cheddar scallion scones, instead. Similar to bread-biscuits, they add balance to the sweet scones we normally have with our tea. For a fuller and formal tea time, add finger sandwiches, desserts and scones—sweet and savory—and make this meal a big deal! 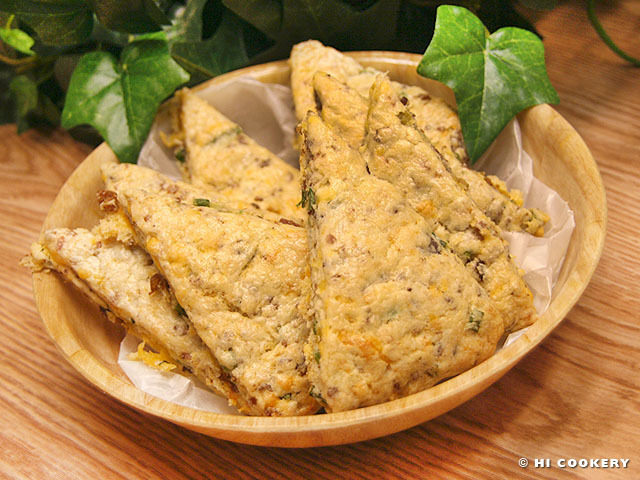 Or for a simple snack, bake bacon cheddar scallion scones on National Scone Day. 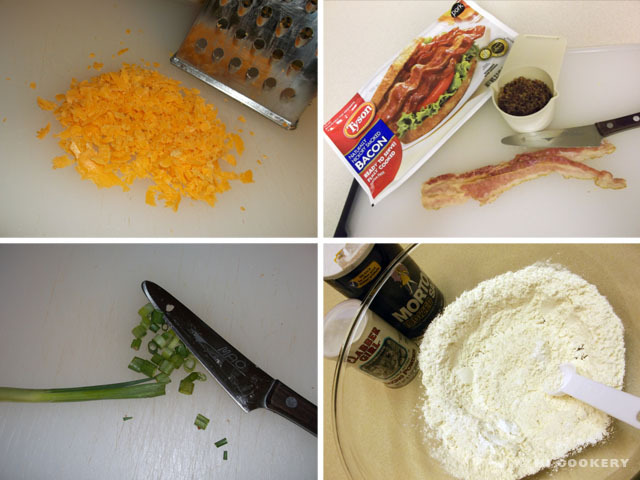 Grate the cheese, cook and crumble the bacon and chop the scallions. Set aside. In a separate bowl, combine the flour, salt and baking powder. Add the sugar to the flour mixture. 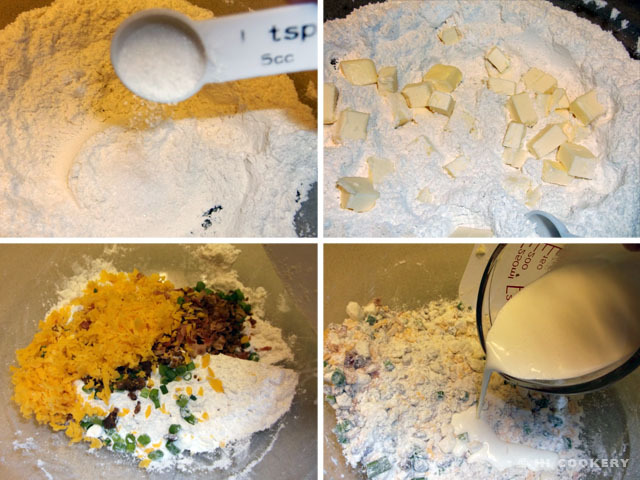 Cut in the butter pieces and mix until they resemble coarse crumbs. Stir in the grated cheese, bacon and scallions. Gradually add the cream or milk (more or less may be needed, depending on your kitchen temperature and humidity). The scone dough should be able to stick together. If it is too dry, add a little more milk. If it is too wet, add a little more flour. Form the dough into a ball. Transfer to a clean surface dusted with flour. Pat the dough ball into a disc. Gently flatten to ¾ inch thick. 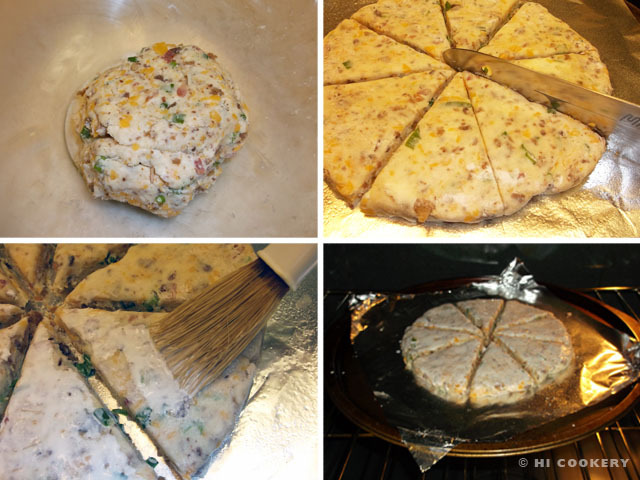 Place the disc on a lightly greased baking sheet. Use a sharp knife to cut into eight wedges. Spread them apart from each other so they do not stick together when they rise slightly while baking. Brush the tops with a little cream or milk. Bake in a preheated oven at 425 degrees F at 20-25 minutes or until golden brown. Remove from the oven. Cool on the pan. Separate the wedges. Arrange on a tea tray. Serve warm or at room temperature. National Scone Day is observed in Australia on May 30 but we join the mates Down Under by posting this recipe in the blogosphere and World Wide Web! Bacon may be fried to a crisp, then chopped finely. We used fully-cooked bacon from the package and chopped it up. Real bacon bits (found in the salad section of the grocery store) may also be used. Scallions/green onions may be substituted for snipped fresh chives. Wedge-shaped scones are traditional but the dough may be cut in rounds as well. Search our blog for other scone and tea time recipes. P.S. After a 7 month hiatus from blogging, I’m BACK! I’m getting ready for National Macaroon Day!!! I just pinned this post. Are you on Pinterest? So good to hear you’re back to blogging! Actually, National Scone Day is celebrated in Australia but not yet in the USA (but we celebrate it anyway because scones are yummy). Great to hear from you again! Love your food calendar reminders!